They’re new! They’re hot! – Drum Bum presents… drumset party lights for drummers, or fans of drummers, or parents of drummers or… well, you get the drift, lol. Hang them around the deck or put ’em in your music room. Now, we’ve got our own lights! Golf anyone? The guys over at Truth Drums are getting quite creative. 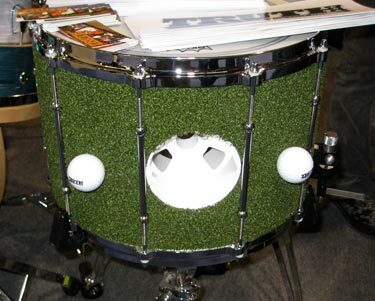 Just when you thought you’d seen everything… enter the “Drumset Putting Green”. Something tells me this little tike is gonna give us all a run for our money. Check out that drumset!!! Roland continues to lead the pack with the highest quality and most popular electronic drumsets on the market. Check out this bad boy! A beautiful Tama Drumset made from Bubinga wood. This makes my mouth water!